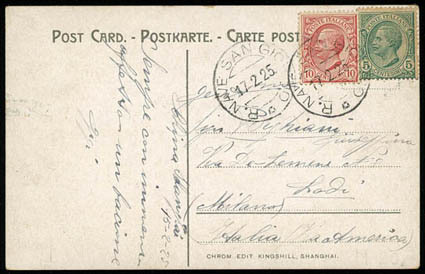 Italian Offices in China, 1899-1920 Naval and Military Mail, group of 15 postcards and three on piece items; 1899-1906 Naval Mail with "Ra. Nave Marco Polo" cds in blue, 1904 June-November on 5 postcards, four of which stampless, "Piemonte" 1903 March-July, 2 postcards during the second campaign of this battleship in China, both sent from Shanghai, one franked by Chinese Imperial Post 4c, tied by Shanghai bilingual cds and carried through the French post showing "ShangHai/Chine" datestamp, and blue "R. Incrociatore Piemonte" cds, being an unusual naval item with involvement of the Chinese and French mails; the other franked by Italy 2c tied by "Ra. 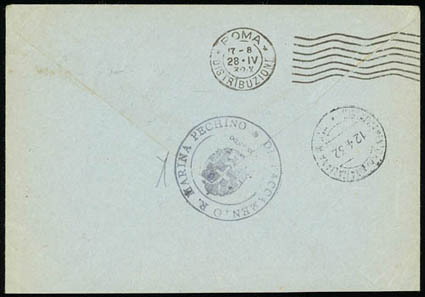 Nave Piemonte" cds, "Puglia" 1904 May-1905 Feb., 4 postcards from Chemulpo (Korea) and Shanghai, franked at at 2c rate with "Ra. Nave Puglia" cds in black and blue, "Vesuvio" 1901 Aug. 22, picture postcard of Italian naval exercises from Shanghai to Florence, franked by 1896-97 2c., tied by very fine strike of "R. Nave Vesuvio" cds (The "Vesuvio" had just arrived then in Wusun to stay until 3rd September on patrol service. 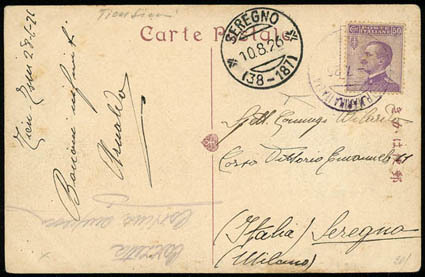 A very desirable item during the Boxer Rebellion; one of just five items recorded with "Umberto" issues, 1900-20 Military Mail with 1903 Sept. 29 Postcard from Shanghai to Vercelli, franked by 1901 1c pair tied by "Comando Truppe Italiane in/Cina" cds, 1904 Sept.-Nov., 2 picture postcards sent from Huang-Tsun to Palermo and Milan, carried with single frankings at 2c and 10c rates, tied by "Comando Truppe Italiane in/Cina" cds, and 1902-04 selection of three on piece items, one with scarcely used "Umberto" 25c., the other bearing 1901 5c. 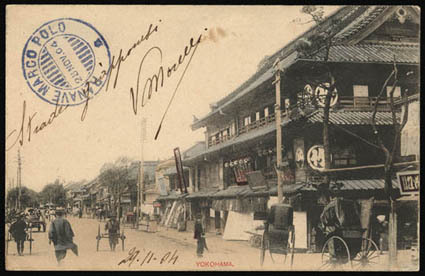 (2), cancelled by "Comando Truppe Italiane/Cina" cds in black and blue, the third is a portion of a Chinese postcard dispatched at Rome with "Umberto" 10c. and extremely rare "R. Truppe Italiane Nello Estremo Oriente/Comando" cachet with Royals Arms in blue at left (only two complete postcards are recorded, also dispatched in Italy), Very Fine. Italian Offices in China, 1908-18 Marines Detachment, 4 picture postcards; scarce 1908 postcard from Peking to Tong Kou, franked on reverse with 1901 20c tied by "Distaccamento Ra. Marina in Cina" cds (Caffaz cert. ), 1918 non-philatelic postcard from Shan Hai Kwan to Peking, franked by China 1913-19, ½c + 1c tied by cds,"Distaccamento Ra. Marina in Cina/Comando" violet cachet on reverse, and two 1918 postcards from Peking to Tientsin bearing "Distaccamento Ra. Marina in Cina/Comando" violet cachet, Very Fine. 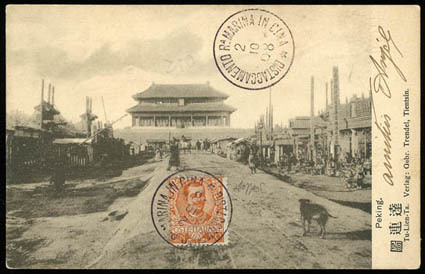 Italian Offices in China, 1925-26 Marines Detachment, cover from Peking franked by "Michetti" 20c (3) and postcard from Tientsin bearing same type 50c, all tied by "Distaccamento R. Marina Italiana in Cina" cds, one scarcely used in violet. Also one piece with 60c tied by the same cds in violet, F.-V.F. ; signed Bottacchi. 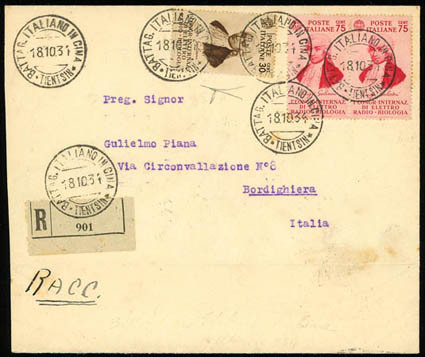 Italian Offices in China, 1925-32 Navy Mail "Colleoni", "Conte Verde", "Lepanto", "Libia" & "San Giorgio", four covers/cards, of which two franked by Italian adhesives with datestamps of the "Colleoni" and "San Giorgio", one stampless of the "Libia" with "Regie Poste/Comando Superficie Navale in Estremo Oriente" free-frank oval, card with Chinese franking sent by a member of the "Lepanto" and cover franked by Italian adhesives with registration label ("R.N. Lepanto" in manuscript) and corresponding cds, registered cover dispatched at Shanghai by an official of the "Conte Verde" during WWII. A difficult assembly including the "Colleoni" which was stationed in China for only one year circa, F.-V.F. 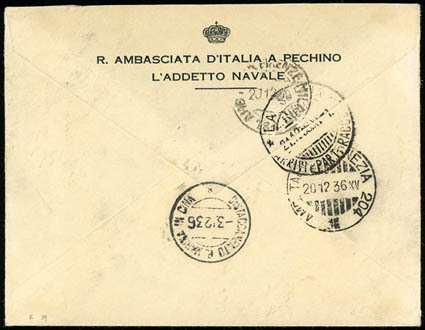 Italian Offices in China, 1932 Marines Detachment, two stampless envelopes to Rome bearing "Distaccamento R. Marina Italiana in Cina" c.d.s., "Regie Poste/Comando Distaccamento/Reggia Marina/DiPechino" oval and "Distaccamento R. Marina Pechino/Comando" cachet, Very Fine; signed Bottacchi. Italian Offices in China, 1932-37 The Black Battalion, an interesting assembly made up of nine items, including three franked covers, of which one registered, and one stampless postcard bearing "Battag. Italiano in Cina/Tientsin" cds; cover with Chinese franking sent by a member of the Battalion; two incoming envelopes from Italy with franking missing and one carried via Macau and Hong Kong with transits on reverse; illustrated postcard of the "San Marco" Battalion and letter dated 30.7.28 with short text regarding operations in China, F.-V.F. ; three items are signed by Bottacchi. 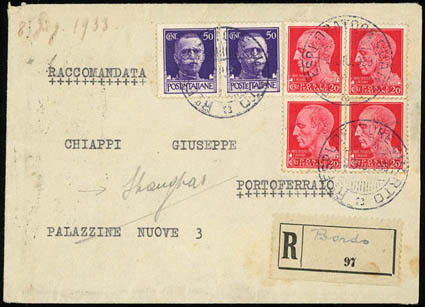 Italian Offices in China, 1933-35 Navy Mail "Quarto", one postcard and two covers, one being registered with manuscript "Bordo" on registration label, carried at three different rates, with "R' Esploratore Quarto" cds, F.-V.F. Italian Offices in China, 1936 Marines Detachment, registered envelope headed on reverse "R. Ambasciata d'Italia a Pechino/L'Adetto Navale" fom the Naval Attaché to the Italian Embassy in Peking, addressed to La Spezia, franked on front by 1929-42 5c., 20c and 50c (3), tied by "Distaccamento R. Marina in Cina" cds's, repeated on reverse, backstamped in transit and arrival, Very Fine. 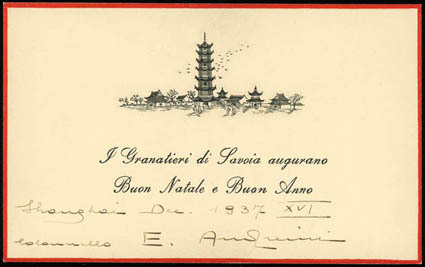 via Siberia, and very interesting illustrated Christmas card of the Battalion signed by its commander Col. Enrico Andreini inside an envelope with China-Italy mixed franking posted at Naples and sent to Rome, struck on reverse with blue "Battaglione Granatieri di Savoia/Sciangai" double circle with Arms, Very Fine, very unusual duo. 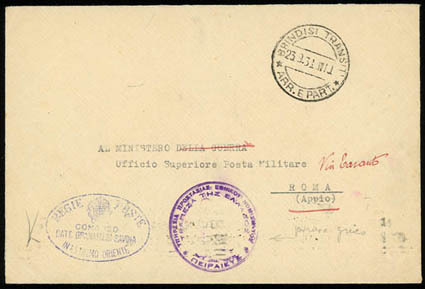 Italian Offices in China, 1938 Savoia Grenadiers in China, cover addressed to the Ministry of War in Rome with very fine strike of "Regie Poste/Comando Batt. Granatieri Savoia/In Estremo Oriente" free-frank oval handstamp, transit of Athens and "Brindisi Transiti" cds, "Battaglione Granatieri di Savoia in E.O./Comando" printed endorsement on reverse, Very Fine, a very scarce non-philatelic usage; signed Bottacchi.